Cleopatra already adored the metallic gleam of her robes. The ancient Egyptians produced their metallic yarns from pure gold, it was tapped into extremely thin gold-leaf which was then laminated with stronger paper. This laminate was then slit with a razor into very fine strips and twisted with cotton or silk. No less sophisticated was the later method, where pure metal wires were pressed and supported by natural fibres. The great leap forward to industrial processing was achieved in 1927, when metallic yarn was manufactured for the first time from aluminium foil. This development brought about a large selection of different qualities. 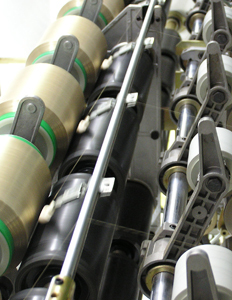 We now manufacture metallic yarns with state-of-the-art processes. Fein-Elast offers metallic yarns made of specially coated polyester, which is reinforced by polyamide in a covering process. All covered metallic yarns listed retain their appearance after the dyeing process. Who else might have fallen head over heels in love with Cleopatra had the ancient Egyptians already known of the seductive tights with the mysterious shimmering gleam.